Accessing resources, learning computer skills and more. 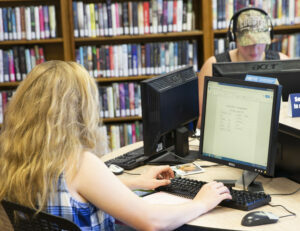 EPL’s Public Computer Center is the one stop place for all the device help anyone would need. Short of device repair, our experts can help patrons set up a tablet, download an app, open a web browser and more. We offer a number of computer classes from topics such as learning Windows 10, to diving deep into spreadsheets in Microsoft Excel. Our Computer One-on-One sessions allow users to get 30 minutes of stress free help doing anything from basic computer skills to more advanced things. All of the computer classes can be signed up for by calling the PCC at 574-294-2847. There’s also basic and advanced Excel classes, basic Windows 10 and now Tech Help. Tech Help is an open desk hours session for help with devices that offers 15 minutes of help without a schedule on a first-come, first-served basis. No registration required. Setup an app, get answers about social media and get help accessing library digital resources. The experts can do almost anything, except fix a broken screen or crashed hard drive. To see all of the computer class offerings EPL has click here.